Kitty Litter Behind New Mexico Radiation Leak at Nuclear Dump? Los Alamos National Laboratory packed 57 barrels of nuclear waste with a type of kitty litter believed to have caused a radiation leak at the federal government's troubled nuclear waste dump, posing a potentially "imminent" and "substantial" threat to public health and the environment, New Mexico officials said Monday. State Environment Department Secretary Ryan Flynn issued a formal order giving the lab two days to submit a plan for securing the waste containers, many of which are likely stored outdoors on the lab's northern New Mexico campus or at temporary site in west Texas. The order says 57 barrels of waste were packed with nitrate salts and organic kitty litter, a combination thought to have caused a heat reaction and radiation release that contaminated 22 workers with low levels of radiation at the Waste Isolation Pilot Plant near Carlsbad in February. The kitty litter soaks up any liquid before drums of waste are sealed and shipped. Officials are investigating whether a switch from non-organic to organic litter is to blame for the leak. According to the order, two of those containers are known to be at WIPP. It doesn't say where the rest of the barrels are, but Los Alamos was in the process of transferring the last of thousands of barrels of waste from decades of nuclear bomb making to the underground dump when the leak shuttered the half-mile-deep mine. Some containers were then transferred to temporary storage at a commercial nuclear waste dump in Andrews, Texas. But all shipments were stopped when investigators earlier this month zeroed in on the Los Alamos container as the likely source of the leak. 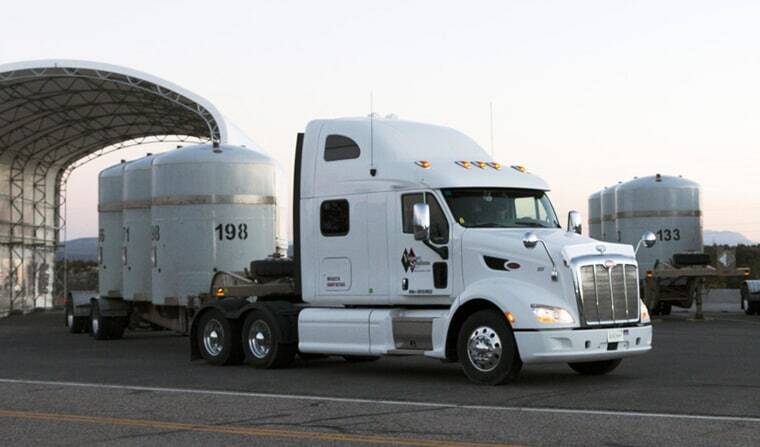 "Based on the evidence presented to NMED, the current handling, storage, treatment and transportation of the hazardous nitrate salt bearing waste containers at LANL may present an imminent and substantial endangerment to health or the environment," the order signed by Flynn states. The lab said in a statement that officials are committed to ensuring the barrels "pose no significant safety or health risk to the public, the environment and the workers." The lab has taken a series of precautionary measures, the statement said, including packing the drums into special containers and moving them under a dome with a fire protection system. The lab is also monitoring the drums for any rise in temperature. The Waste Isolation Pilot Plant is the federal government's only permanent repository for low-level nuclear waste from Los Alamos National Laboratory and other federal facilities. The containers include things like gloves, tools and protective clothing worn by lab workers. Nine days before the radiation leak, a truck hauling salt in the mine caught fire. But officials have said the fire was far from the waste-handling area and that the events were likely unrelated. Initial investigations into both accidents have blamed them on a slow erosion of the safety culture at the 15-year-old, multibillion-dollar site.